The 50th Anniversary milestone will be celebrated with a Museum ‘Open Weekend’ with FREE admission on Saturday and Sunday 1st and 2nd of December, from 10am to 4pm. How it all began…. In June 1964 a group of community minded people had a vision about the preservation of local history and held meetings, put out appeals for historical artefacts, archival material, furniture, household items and memorabilia. Members travelled around farms collecting machinery, tools and any obsolete vintage items that had fallen into disuse. At first there were only 20 financial members but due to the overwhelming support of the Manning Valley Community, the historical collection and membership grew. Through the generosity of the Wingham Services Club, the old Moxey’s Store in Wingham became available for purchase with a low repayment and the Wingham Rotary Club played a vital role in helping to maintain the outside of the building. The Society was named the Manning Valley Historical Society because the aim was to cover the historical interests of the entire Manning Valley. On the 29th November 1968, the Museum at Wingham was opened by the famed aviatrix, Nancy Bird-Walton. Entirely run by volunteers, the MVHS has seen many changes over the decades. Since the completed purchase of the buildings and land and incorporation, finance has become more available for extensions and renovations, including a brick archives for research and fireproof storage area for the preservation of documents, maps & photographs. 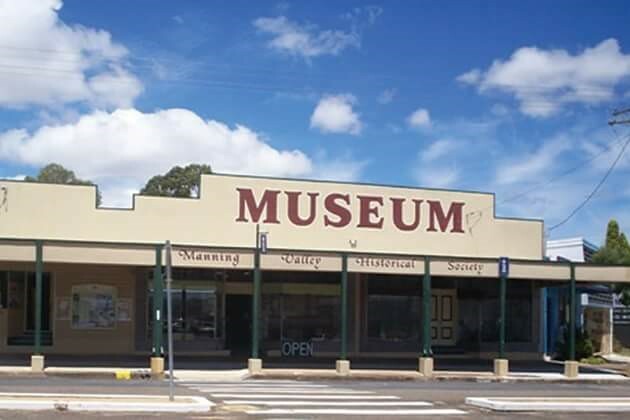 Over the past few years there has been ongoing building maintenance, collection conservation, also major refurbishment with increased themed displays throughout the museum and updated signage to assist museum visitors in gaining a better understanding and appreciation of the history and culture of the Manning Valley and inhabitants. Congratulations Manning Valley Historical Society members, past and present, as your diverse interests, skills, energy and enthusiasm have created ‘one of the best regional museums in NSW’. Christmas Party Lunch – Invitation to members, Wednesday 5th December 11.30 for 12pm. Cost $5. This year, we are having our party at home, in the museum meeting room, 12 Farquhar St; Wingham. The meeting room is now air conditioned and members can overflow out under the front awning. The menu will consist of chicken, salad and sweets. If you are looking for something small and affordable for presents, we have new Christmas stock which is locally crafted. Also, there are new souvenirs promoting the museum. The Wingham Municipal Housing Scheme article which was published in MVHS Journal, number 58, has been sent to the printers to be produced as a small booklet. It will be available for sale before Christmas. Departing by train, Thursday 7th March, visit on Friday 8th March 2019 and return home Saturday 9th March. 6553 5823 on Tuesdays for the itinerary or to register. Costs for accommodation are being obtained at a budget price. Individuals to cover their own travel and accommodation expenses. An Opal card will be required for train and bus travel in Sydney. Closing date for bookings 15th December. The closure of the Wingham Chronicle office has resulted in the archives being given bound and loose copies of the Wingham Chronicle. The loose copies are duplicates of the bound and due to lack of storage we are disposing of these copies. If anyone wants them they are available for collection. February will be the closing date. 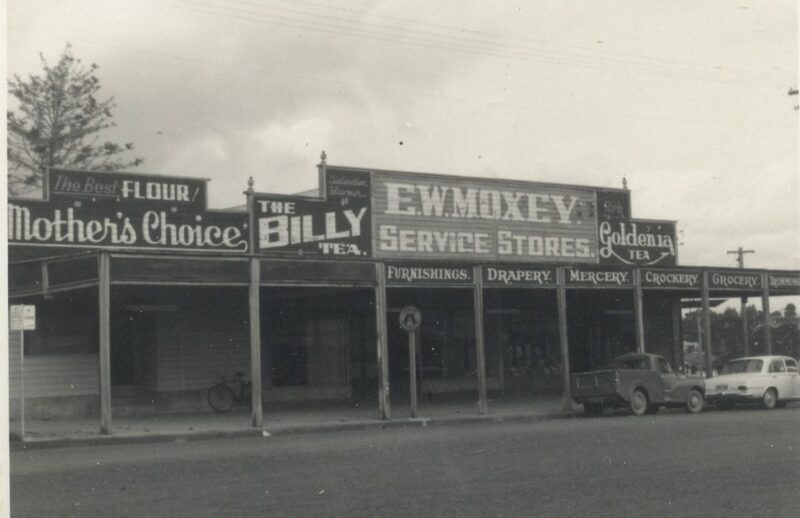 Advertising in the 1919 Wingham Chronicle promoted E W Moxey’s store at Wingham as being the bright and busy store. Even today, as the home of the Manning Valley Historical Society, the building has a friendly and well-kept atmosphere. Some interviews conducted with past employees and relatives of the family business depict E W Moxey and his predecessor Percy Neate Dark, as being popular employers who played prominent roles in the affairs of the town. Mrs Queenie Easton’s memories stretch back to the days when the store was owned by her father, Percy Neate Dark, whom she remembers as being a good businessman…. 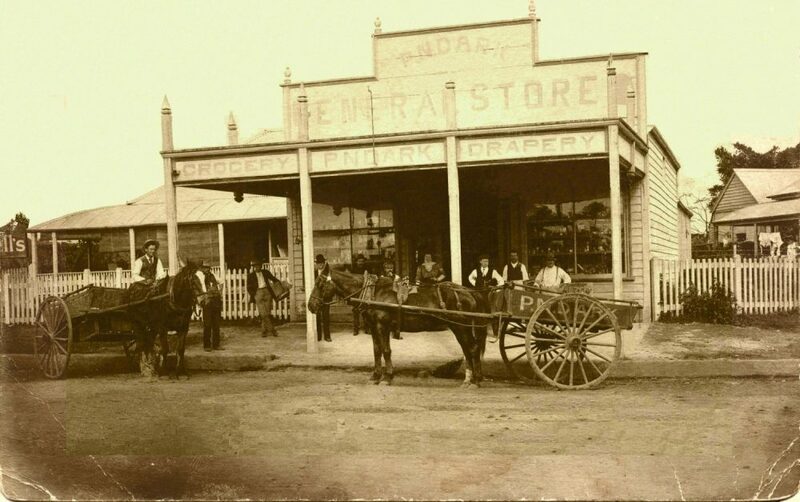 …Originally the store was owned by Wade and Dark but, just before 1900, he (Percy Dark) bought his partner out and in 1901 married Kate Dimond. …I can’t remember the shop being without him. Percy Neate Dark to Katrine, eldest daughter of William Dimond. …After selling to Mr Moxey he had a bakery shop in Wingham for many years until he died in 1948. Mrs Easton recalls that Miss Alice and Miss Laura Tetsall worked for her father and also Mr Bill Thomas. Mr H J Dimond could also relate many anecdotes …My dad, John (Jack) Dimond worked for his brother in law, Percy Dark, originally in dealers’ wagons. He did a lot of bartering and came back from farms with eggs and fowls. If they went through a flooded creek, the fowls would get drowned. Percy Dark owned the second motor car in the area and Uncle Bobbie Dimond used to drive to Raymond Terrace to pick up travellers from the railway station and take them up as far as Kempsey. E W Moxey’s daughter, Gwen Allen, recalls that her father bought the store from Percy Neate Dark about 1914 and over a period of about 30 years expanded the business. …The residence (next to the store) which was lived in by Mr E W Moxey when he first came to Wingham, was pulled down about 1924-25, when another house was built in Bungay Road. George Gibson, Thora Griffith’s father, was there in the early days and delivered the orders into the country by lorry. Bobbie Dimond used to go out into the country with a horse and sulky to collect orders and the next day they were delivered. 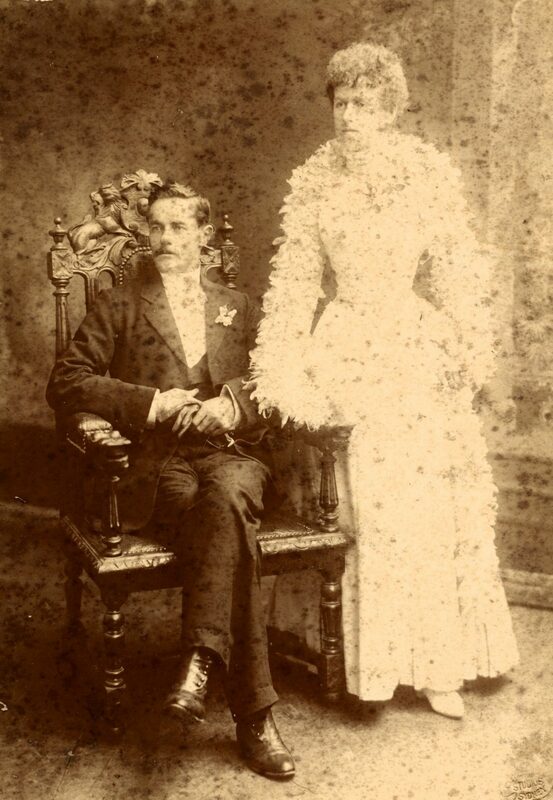 Hec and George McKenzie worked in the shop and a Miss Morris looked after the drapery section. She lived at Cross’s Hotel (now the Wingham Hotel). The war years (1939-45) were hard work because of limited labour and supplies. Food and clothing coupons were used to purchase goods. After dad died in 1945, the business was eventually sold to Conways Cash Stores and Mr Terry Liddell was worked as manager. …Mrs Vera Murray, Jock Witchard, Mr H J Dimond, Noel Witchard, Ross Witchard, Mick Witchard, Ernie Brewer and Frank Small. Mick Witchard delivered groceries around the town and into the country areas for about 10 years in the 1950s. The country run had about 20 stops. The drapery section wasn’t sold to Conways and Gwen Allen kept it on till the store closed in 1960.